The map introduced in this issue, the Iaponiae Insvlae Descriptio map, is the earliest European rendition of Japan that depicts the state with a fair level of exactitude. It is by Luís Teisera, a celebrated Portuguese cartographer who was backed by the Spanish court. In 1595 the Dutchman Abraham Ortelius published a map based on Teisera’s drawing inAdditamentum Quintum, Theatri Orbis Terrarum; the first edition of this atlas appeared in 1570. The map accurately plots various Japanese towns and their locations in Roman letters, and suggests that it was founded on information sent to Europe by Jesuits in Japan. In fact, although Teisera was a Jesuit, he himself never set foot in Asia, let alone Japan. The Iaponiae Insvlae Descriptio was based on Gyōkizu, a simplified map showing the main islands of the country, which circulated in Japan during the period when Teisera’s map was drawn. Gyōkizu maps were named after Gyōki (668-749), a Nara period Buddhist monk who orchestrated major social and civil engineering projects; travelling in and around the Kinki region as an itinerant monk, he helped develop the local infrastructure including building bridges and flood defences. Antique maps that survive to this day credit Gyōki as their author and hence they became collectively known as Gyōki maps (gyōkizu) and were the principle geographic image of Japan until the middle of the Edo period (1615-1868). Incidentally, despite Gyōki being identified as a pioneering cartographer, there is no evidence to suggest that he himself actually drew a map of Japan. Compared to Gyōkizu, Teisera’s map articulates the western coastal area of Kyushu in far greater detail and with more precision. Other parts of Japan remain less defined, probably reflecting the observations and surveys carried out by Portuguese sailors. 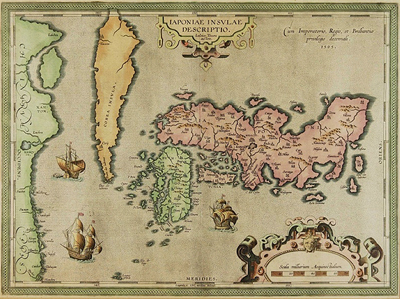 Teisera’s map is unique in its integration of the Japanese Gyōki style with European cartographic technology. The map was displayed as part of a special exhibition, JAPAN: Historical Images from the Cortazzi Collection at the Embassy of Japan, which closed on Thursday 18 July. The exhibition provided a unique opportunity to explore the exquisitely preserved print. On 22 October the Sainsbury Institute will host an event for the Friends of the Institute when we will display the treasures of the library, which have been introduced in this series of article and many more. Cortazzi, Hugh. Isles of gold: antique maps of Japan. New York: Weatherhill, 1983. Hubbard, Jason C. Japoniӕ insvlӕ: the mapping of Japan. Houten : Hes & De Graaf, 2012. Unno, Kazutaka. Chizu ni miru Nihon: Wakoku, Jipangu, Dainihon. Tokyo : Taishūkan Shoten, 1999. Unno, Kazutaka. Chizu no bunkashi: sekai to Nihon. Tokyo : Yasaka Shobō, 2004. Izumi-shi Kubosō Kinen Bijutsukan shinzōhin senshū. Izumi-shi: Izumi-shi Kubosō Kinen Bijutsukan, 2012. Kokushi daijiten. Tokyo: Yoshikawa Kōbunkan, 1979-1997. Seiyō ga tsutaeta Nihon, Nihon ga egaita ikoku. Tokyo: Insatsu Hakubutsukan, 2004. Seiyōjin no egaita Nihon chizu : Jipangu kara Shīboruto made. Tokyo: OAG Doitsu Tōyō Bunka Kenkyū Kyōkai, .